The student courses use the "Student texts", in the instructor course we add the "Instructor's manual". 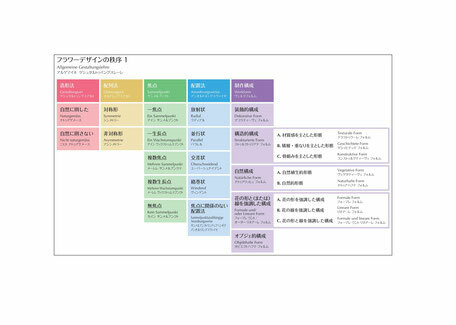 The Schema, which is always used for each lesson, is a list of the original forms of flowers. A lesson along the schema will help you understand the concept of design. The student course consists of 144 lesson items in total. 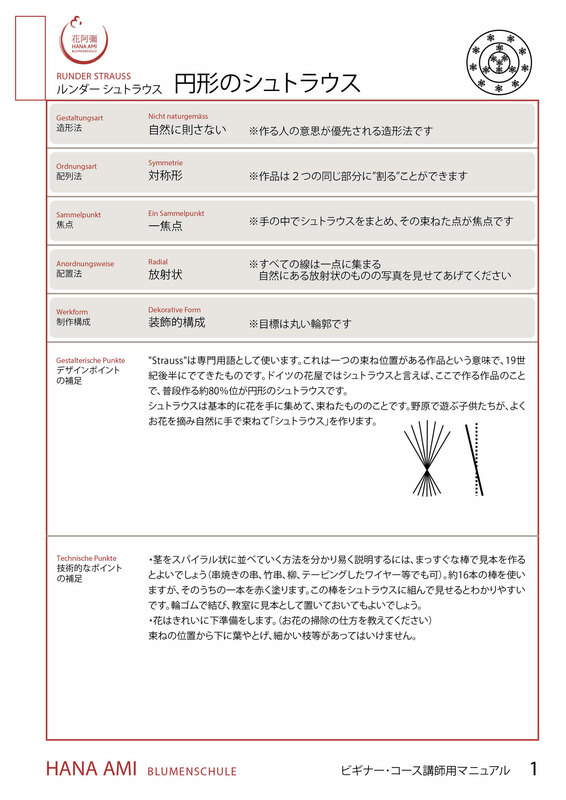 Each one of them has a different text, and at each lesson one sheet for one item is distributed. 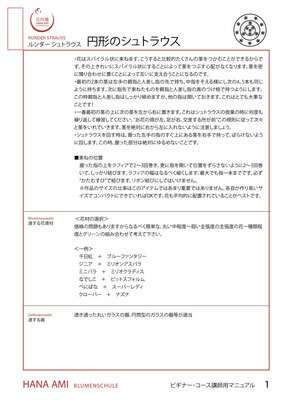 It contains an explanation of the design's theory based on the Schema, plus the technical points of how to make the work. 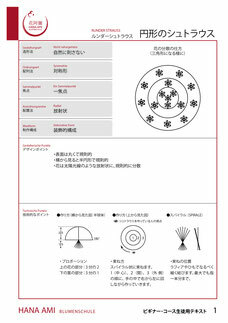 The design is explained with an image sketch, advices are added. In the upper courses, students will fill out the textes partially on their own to deepen their understanding. We are preparing textes for foreign students in their languages. To teach the 144 items of the student course, a teaching manual for instructors is needed . It is characterized by not only a detailed explanation of the theme of each item and the knack of the making, but also contains all related matters like a list of suitable flowers and materials, teaching advices and cultural background informations. It also helps the instructors-to-be to establish their own style and to deepen their teaching skills. 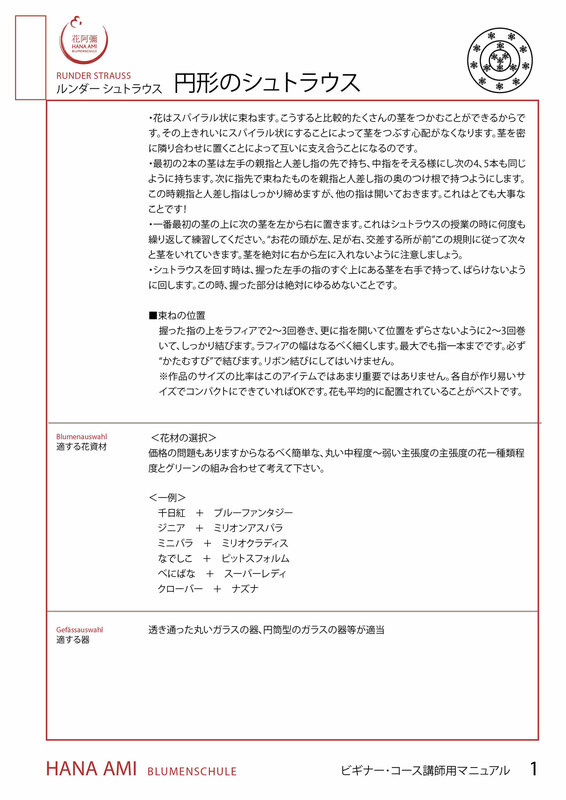 For foreign participants we prepare manuals in their language. Schema means "diagram" in German. The Hana Ami Blumenschule Schema is a systematic collection of floral design theories, a unique backbone and an original of our school. It is a guide to create a unique work using the beauty of the flower, it helps to understand the mechanics and points of design, and it enables the learners to understand why a design is beautiful. The biggest feature of the Blumenschule method is that you can see the reason for the design, explaining why you feel that it is beautiful. Each lesson is ending with a schema check sheet to understand the theory of design even better. 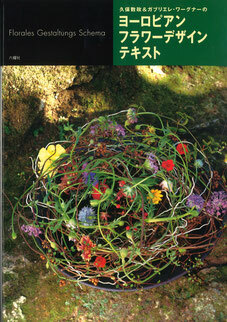 The contents that are taught by the Hana Ami Blumenschule are based on this book: "European Flower Design text". Since the first edition in 1996, until 2003, it was reprinted 6 times in a row. We are still happy and proud that this book is widely accepted and loved by many. 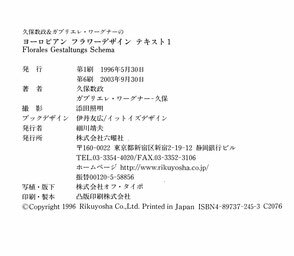 In the Hana Ami Blumenschule instructor courses , we use all the important pages of this book as the basic material for our instructors. The value of what we wrote in this book is still unchanged.